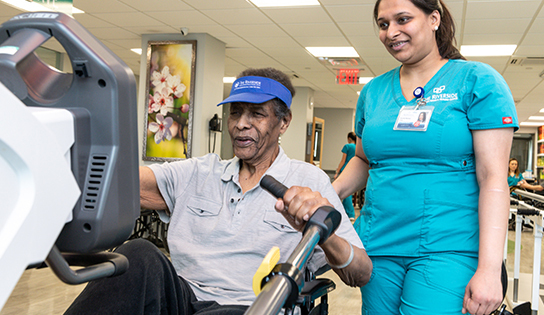 Covering almost an entire floor of our community, with breathtaking views of Riverside Park and the Hudson, our Rehabilitation and Therapy Center allows us to provide cutting edge rehabilitation for both body and spirit. Watch the river traffic drift by below as our multidisciplinary team of experienced, dedicated therapists and doctors guide you on the path to recovery. The Riverside offers an expansive program of therapies both standard and unique. Our program is designed to help you regain mobility and independence, with a focus on helping you reintegrate into your familiar daily routine. We will help you get back to doing what you love, quickly and confidently. Our highly skilled staff is renowned for their passion and love for helping their patients heal, and it shows. You will receive personalized attention as we work together with you, your physician, and your family to develop a customized program of therapies- many of which are provided up to seven days a week- to ensure the best possible outcome. Programs are tailored to meet your needs, whether to regain full mobility after joint replacement or recondition you physically following a cardiac episode or a hospital stay. With our Rehabilitation programs, we offer an unprecedented level of care and comfort.